The Colts started brightly with Brownlee going close before Croskery opened the scoring after twelve minutes following good work from Sweeney and Magee. Soon after a strong solo run and shot from Magee was tipped past the post by the keeper. From the resultant corner by Early, Murray headed across goal for Croskery to stab home. his near post to maintain the lead. However, just before half time Croskery completed his hat trick when he cut in from the right to fire a left footed shot to the bottom corner of the net. The Colts struggled to maintain their first half dominance as the heavy pitch took its toll. Colts scored their fourth with the goal of the game when Curran ran from inside his own half beating two defenders to calmly slot past the advancing goalkeeper. Newcastle had more possession in the second half and Overend was forced to make two fantastic saves to deny them but could not prevent Newcastle scoring a consolation goal late on. Colts were well served by Sweeney, who was excellent throughout, McDonnell and Curran. THE Colts played against the wind in the first half in difficult conditions at Ormeau and from the first whistle took the game to Cliftonville creating several half chances. After 10 minutes, they reaped dividends as Hamilton rounded the ‘keeper and slotted the ball into the net. With the wind at their back Cliftonville could not take advantage as all their attacks were easily dealt with by the Colts defence and the Colts got a second from the boot of Davies – his first of the season. The Colts were now dominating all over the pitch and creating chance after chance as Hamilton got his second leaving the score 3-0 at half time. The Colts played the second half with the wind at their backs and with the comfort of a 3-0 lead really turned on the style playing one-touch, pass and move football. Cliftonville could not cope with the movement of the midfield and the forwards and it was no surprise when McCabe got on the score sheet with his first of the season. For the remainder of the game Cliftonville were on the back foot with the Colts looking for more goals and it was McCabe who scored again after good work down the right by McGleenan, Madden and Loughran. With five minutes to go McCabe grabbed himself another two making his tally for the day four goals and securing all three points for the Colts. Carryduff: P O’Neill, J McCrea, G Henderson, C Davis, (A Waddell),C McGleenan, R Van Merkom, E Madden, P Loughran, O McGowan, D Hamilton, McCabe. WINLESS Carryduff Seconds travelled to fourth-placed Greenisland having lost to the same opposition at home two week previous. The visitors drew first blood mid-way through the first half when goalkeeper Mark Burnett assisted by a strong wind scored from his kick out. However, Carryduff could not hold on to the lead and Greenisland equalised before half time. The home side took control in the second half increasing their lead to 3-1 with 20 minutes left. Carryduff were handed a lifeline when midfielder Gerry Clifton scored with a header from a David Patterson cross and when sub David Graham was pulled down in the box, Patterson converted the penalty to give the visitors a point. 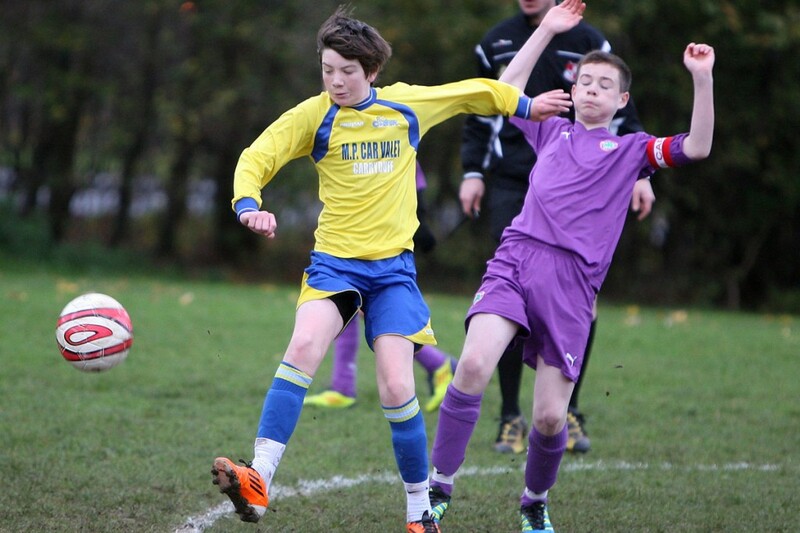 THE Under 13s moved into the second round of the NIBFA Cup with a fine win over Ballyclare. It was the first time this squad reached into the second round of the tournament as they came out on top of a tough encounter. Starting with their strongest line up, the back four of Paddy Hinds, Ryan Murtagh, Ronan Lavery, and Connor Cunningham soon let the Ballyclare forward line know that they were in for a torrid time with crunching tackles and pressing forward at every opportunity. The midfield quartet of Ben Davis, Christopher Campbell, Mark Agnew and Connor Maguire soon took control while up front Elijah Doyle and Dylan Strong looked dangerous as the Colts launched attack after attack. The Colts efforts were rewarded after seven minutes when the ball broke to Maguire at the edge of the box and he swept the ball past their keeper to give the Colts a deserved lead. The goal spurred Ballyclare into action as they pushed to get back on level terms but Simon Henry was on top form with three excellent saves. On the brink of half time a second goal came as Ballyclare failed to clear a corner and Maguire was again on hand to finish clinically to send the Colts into the break two up. The Colts strengthened the midfield after the break with Tommy Connery replacing Strong. Playing against the wind the tactical switch was needed as Ballyclare upped the tempo as they took the game to the Colts. The Colts were now showing a new side to their game with hard tackling, great support playand breaking in numbers trying to get the third goal that would kill the game. The benefits of having a good squad was proving priceless. The introduction of Connor McCann, Brennan Mulholland, Luke Devlin and Jack Foy for tiring legs ensured that the Colts were not going to lose this one.